St Afan's church dates from the 13th or 14th century. 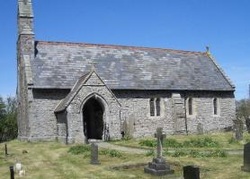 It was rebuilt in 1866, when the architect was Charles Buckeridge, who was also responsible for Llanlleonfel church - the other church serving the village of Garth. The full name is Llanafan Fechan (the lesser) to distinguish it from Llanafan Fawr (the greater), which is a few miles to the north. Both churches have always served sparsely populated parishes. They are dedicated to St Afan, a Celtic Bishop, who was usually known as Afan Buallt, indicating a connection with the Builth area. In the churchyard at Llanafan Fawr is a memorial stone with the inscription "AVANIUS EPISCOPUS". This may be where St Afan was interred, but there is nothing to show where and when he was Bishop. He is said to have been murdered in a field below Llanafan Fawr Church. The great Celtic monastic church of Llanafan Fawr was the mother church of the area, Llanafan Fechan would have been an outpost of it. Recently, records of both churches during the 18th and 19th centuries have been discovered. These show that curates from Llanafan Fawr would have served Llanfechan. Llanfechan Church stands on a distinct mound of raised stone, and the roughly circular churchyard is a sign of its antiquity. The old church was, as is the present one, a simple, one chamber building. Theophilus Jones remarks that there was "nothing in the appearance of it to gratify the pious protestant or to detain the learned antiquary". The font dates from the 14th century. To the North West of the church an area of ridge and furrow can still be made out. 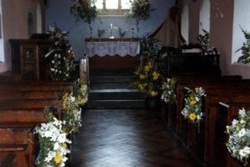 St Afan's can be found on the A483 mid way between Cilmery and Garth, 5 miles to the West of Builth Wells. Coming from the Builth direction, it is situated on the right hand side of the road and is reached by turning right into a side road and through a farm yard.